There's just something so irresistible about Banana Muffins baking and the way the aroma fills the house with the promise of something delicious soon to be ready to eat. Anticipation! It's hard to wait until until those sweet smelling muffins are done! When my children were young, we had a book called, "The Muffin Munching Dragon", which was a favorite of all, especially Son number 2. It's the story of a dragon that forces a village to make him muffins everyday, or he will burn down the bridge, causing hardship on all. Everytime I read this, my son would ask me to please make muffins! "Please, Mom, make me muffins"! And of course, I would do just that! 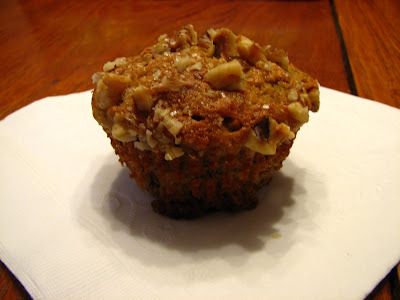 We still love muffins and Banana is one of our favorites. This recipe is one I found on Epicurious, which was published in Bon Appetit. It calls for Macadamia nuts, but I like to use walnuts, plus a couple of other small changes I made. They are absolutely delicious and addictive and you should make them, now! Or, at least for breakfast tomorrow. Preheat oven to 350 degrees. Line 12 muffins cups with muffins papers. In a large bowl, sift the first 4 ingredients together. In a medium bowl, combine mashed bananas, both sugars, butter, milk and egg. Mix into the dry ingredients; stir until just blended. Don't over stir. Divide the batter among the 12 muffin cups. Top with the chopped walnuts and a sprinkle of sugar, if desired. Bake until muffins are golden and a toothpick inserted comes out clean, about 25-30 minutes. Remove muffins to a rack to cool. Eat and enjoy! The texture of these muffins is light and they are so flavorful. The original recipe calls for nuts to mixed in the dough as well as used on the tops, but part of my family doesn't like the nuts, so I only use them on half. I also like to sprinkle on some Sugar in the Raw for some extra crunch. If you like Banana muffins, you'll love these! What's your favorite muffin? Banana muffins cooking do have a wonderful unique smell. Yours look delicious! 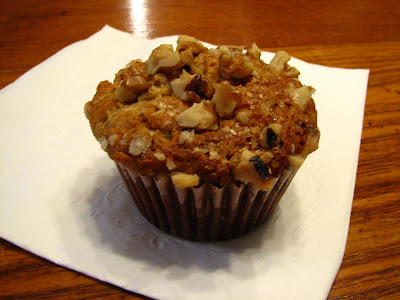 I love banana muffins or bread with walnuts - they were meant to be together. Your muffins look great! These are my husband's favorite. I am going to make these next week, when my oven is back up and working! They look fantastic! I want some of these for breakfast too! These look amazing! Yummmm, banana muffins--they are certainly special. I see yours and I want one right now! Wouldn't it be great if they came up with some sort of smellometer for computers, a bit like scratch and sniff, to capture some of these deicious aromas. These look super, Lynda, I do so wish I wasn't allergic to bananas. Jan, it would be great if we could scratch and sniff the computer screen and really smell these tempting pictures that everyone posts!